We value and applaud excellence wherever we see it, believing it comes from passion. And fueled by our passion, we're committed to providing you with stunning images, in the finest-quality presentations, accompanied by first-class client services. "A compatible piece of Art is like a good friend"
Artwork sets the tone and mood of your surroundings. It's a comfort and a joy. It's also an investment in both money and wall-space — and whether you hope an image will appreciate in value, or its value lies in your appreciation of it, you deserve to love seeing it in your space. Our new collection of contemporary photographs, titled Liquid Abstracts, exquisitely captures the ever-changing beauty of ocean water on the sand at the Tideline. A glimmer of golden water swooshes over the sand; the sand is etched with an intricate, never-to-be-repeated pattern. Artist David Björkman came to the Tideline as a photojournalist. "I approached the beach like I would a street scene, capturing what was there. Over time, my 'painterly genes' ignited, and I began to see the Tideline in two dimensions like it would be on canvas. Now I view my work as painting with my camera." The essence portrayed in vibrant blues, black and aubergine, a moment of collision stopped in time. Our Fine Art photographs have a brilliant luminosity and deep color saturation. Choose from 2 presentations to suit your preference: Museum Mount (image face mounted to acrylic backed by a hidden frame), presents the photograph as an object of art — like a painting — extending out from the wall, and Back Mount (on archival backing ready to frame), presents the photograph more traditionally in a contemporary frame. 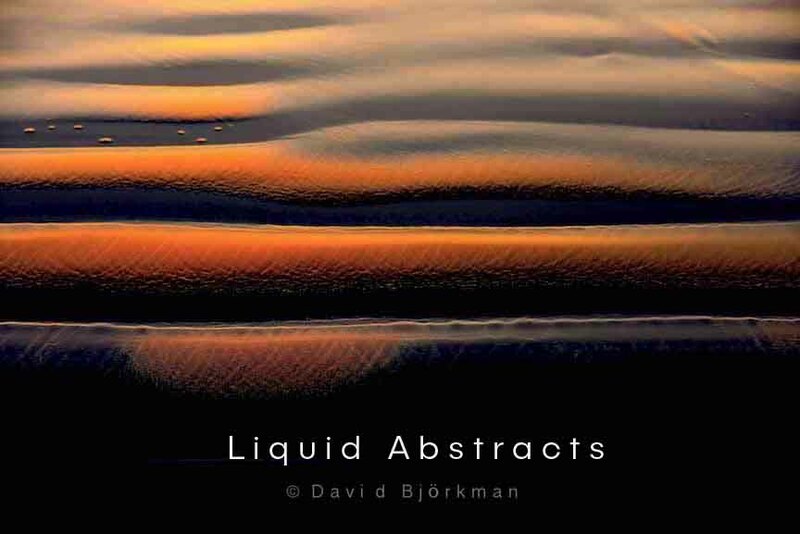 Our Liquid Abstracts are limited-editions, 40 prints each, signed, including a Certificate of Authenticity. We hope you feel the same enjoyment we do, when you experience the New Wave.